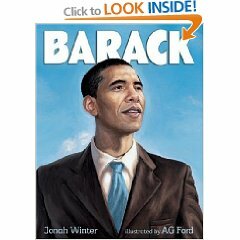 Bruce Handy , a self-professed Obama fan, reviewed three children’s biographies of Barack Obama for tomorrow’s New York Times Book Review. As an Upper West Sider and member of the media elite, one who’s scared of John McCain’s rickety temperament and doesn’t find Sarah Palin credible on any subject or even as hot as Republican bumper stickers and obliging foreign leaders would have us believe…I’m all for Obama. Just Say No Deal is a coalition, whose members may oppose the candidacy of Barack Obama for many reasons. The account of dead children is true. Even http://www.factcheck.org has reported that Obama’s claims about this issue are not true. the views of this blog or any of its writers, except of course for myself. With him may my country never collide. Or to employ such metaphors dared. Fail to be met with the highest acclaim. To declare which, his spouse herself has made bold. If for him you voted, this be your due. Proclaiming in song that the East is now Red. The color of blood of a baby who’s dead. And children who now have drawn their last breath. And of a dark night about to descend. Each human life to the weakest protect. A nation’s healing at last let ensue. Editorial Note: The theme that is referenced in this poem regarding Senator Obama’s opposition to a bill which would have directed abortion providers in Illinois to resusitate fetuses born alive after an abortion is a sensitive subject for many people. We at The Confluence do not dictate how people should feel about abortion. We respect the views of our readers from both sides of this issue. However, in general, the sentiment of the readers at The Confluence is that we believe that abortion should be safe, legal and rare and that all of us, no matter where our starting point, can work towards the goal of prevention of unwanted pregnancies as the best way to insure that abortions are unnecessary in the future. We have never understood the irrational hatred of the press towards Hillary Clinton. We know why the Republicans couldn’t stand her husband, Bill. It was because he was actually the one in charge during the nineties and they never accepted him as legitimate. Besides they were on a roll with Movement Conservatism. Yeah, all that hard work was paying off, once they made up their minds to fight their exile into the wilderness after Barry Goldwater’s defeat. That never explained viciousness of the media towards Hillary though. And then Hillary proceeded to dismiss the White House travel office staff who was collaborating with the media for sweet travel deals and gossip. We think that was approximately the time the $%@# hit the fan. Oh, sure, the Republicans gave both Clintons a colonoscopy with 8 years of investigations. It was relentless and brutal- and categorized in minute and embarrasing detail on the pages of the Washington Post and the New York Times. Seven years of the worst president in history, a president the media helped to put in power, was not enough to curb the media’s enthusiasm for trashing Hillary. When the primary season started, they picked up right where they left off. Hillary was the media’s favorite punching bag. She almost won too. It drove them NUTS. What it came down to was that a significant fraction of the American population, backed by a lot of money and political influence, simply does not consider government by liberals (even very moderate liberals) legitimate. Ronald Reagan was supposed to have settled that once and for all. We’ve often heard it said that Hillary’s campaign was nasty towards reporters. But I used to sit in on those conference calls between the media and Howard Wolfson. I often came away impressed with Wolfson’s comparative composure. The venom that flowed from the likes of Andrea Mitchell was astonishing in its sarcasm and sheer unmistakable contempt for anything Hillary said or did or planned. After 15 years of this stuff, I wouldn’t have liked the media much either. Paul has been hanging out with his buds at the NYTimes too long. He has started to believe what ever new fantasy they are promoting these days. This new meme about voters longing for Ronald Reagan is pretty stupid. I don’t doubt that some of McCain’s fans are waxing nostalgic for the Great Communicator but I suspect the real source of their discontent is similar to ours on the left who can’t stand Obama. It’s like we didn’t have any choice in the matter. The media did the picking of our nominee this year. The voters were superfluous. We on the Democratic side were steamrolled if we wanted Hillary Clinton. We’ve been told that neither our opposition or our votes are legitimate. Both the DNC and the media had a hand in stripping us of our ability to affect the election. But our resistance to Obama is not about Hillary anymore. It’s about preserving our right to self determination. Now, Republican voters are getting a taste of that same media fueled Obama juggernaut. Those of us on the left who experienced the “Hillary can’t win, it’s mathematically impossible” haka that began in February recognize the “It’s over. Obama won!” haka of October. But Republican voters have yet to connect this meme with the intense psychological warfare that David Axelrod is throwing at them with the media’s help. And Krugman is completely wrong when he connects the agitiation of the anti-Obama voters with Reagan. I survived the Reagan years as a college student. There is nothing about Reagan that I liked, admired or wish to have again. I loathed the guy. In fact, I really wish both McCain and Palin would drop the lavish praise of Reagan. Whenever he is mentioned, I lose whatever tepid warmth I have for the Republican ticket. Today we see a new media frenzy over Sarah Palin’s Troopergate problem. I guess I’ve been watching the Hillary vs Sally problem long enough to know that it doesn’t amount to a hill of beans and no one but the media and the cognitively dissonant in the Obamasphere will care. So, she tried to get her brother in law fired after he did some things that would get most people fired. So she went about it the wrong way. The way the media is behaving, you’d think the only reason she ran for governor was so she could use the full force of her office to torment and harrass this one man. It reminds me of the massive amount of ink that was wasted on Hillary’s missing billing records and the federal case that was made out of that. Or the unintentional exaggeration she made of one of her Bosnia trips. Or her firing of the White House travel office. Who frickin’ cares? What I can’t understand is how it is that Krugman, the Princeton economics professor with the massive brain that crunches data without effort, can’t understand what’s really going on with voters at McCain rallies who resent the media’s interference with their ability to make a decision and have it count. 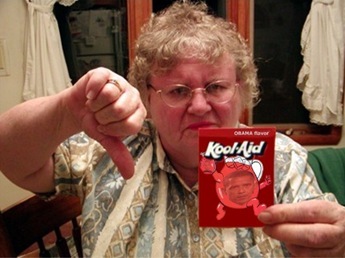 I’ve been asked repeatedly of late if I have any tips for people who have loved ones trapped in the cult of Obama. After consulting with my good friend Captain Spaulding who has lots of experience with cults and trapping people, I offer this handy guide. Obamamania is no joke. The first step is believing the media hype. Then comes the experimentation with Kool-aid, and before you know it, BAM! – you’re a brain-eating zombie. It makes me ill when I smell the fetid stench of sugary swamp bilge oozing from some Kool-aid slurper’s pores. I think it’s the rotting odor of decaying brain cells wafting out with every hot exhalation. 1. The inability to use logic and think rationally. If your friend or beloved family member isn’t already, um . . . “receptive and ready” to begin deprogramming, you will have go catch them convince them to come with you for treatment. The Captain recommends duct tape and a large windowless van for transportation. Before your patient arrives, you need to make preparations. We recommend a large house, preferably with a basement and neighbors who mind their own business. Select a well-lit and cozy room and furnish it with a comfortable bed and chairs. On every wall should hang several pictures of Hillary and Bill Clinton. Pleasant music and aroma-therapy scents should be brought in. This will be your room. Take the least desirable room of the house, and remove any amenities like carpeting or lighting. Board up the windows but be sure to leave openings for cold drafts. Plumbing is optional, depending on your sense of smell and how hard you plan to work. A plastic bucket works for the Captain, but you may want to include lots of air freshener. “Brain-eating” is a metaphor, your patient will eat other things. Gruel is a common and easy to prepare meal, with some occasional “mystery meat” from your refrigerator for variety. DO NOT feed them Cheetos, no matter how much they beg or plead. Those little orange puffs of imitation food are a gateway drug. The length and intensity of the treatment will depend on how much you really care about your patient and what happens on November 4th. For the first step in the treatment process you will need to obtain a fish about 18 inches to 2 feet in length. Fresh fish are available for a reasonable price in most large supermarkets, but for those on a budget you can obtain not-so-fresh fish for free from the supermarket dumpster. Secure your patient to a chair with generous amounts of duct tape, leaving their head and shoulders exposed. Blindfolds optional. In a loud firm voice say “Nobama” while striking your patient across the face with the fish. (Don’t hold back, really smack them) Continue saying “Nobama” while striking them back and forth in the face with the fish. Go ahead and yell it if the neighbors can’t hear. Keep doing this until your arms are too tired to continue. This won’t help your patient but by now you should feel much better. Repeat Step 1 as often as you feel like it, but eventually you may need another fish. I hope this guide has been helpful. Good luck and happy hunting.